General Characteristics: Short, stiffly erect, stocky, maturing within 9 to 12 months, producing from 5 to 10 oha; characterized by short, stocky growth, broad, horizontal, crinkled leaves, and light self-green coloring of the petioles. Petiole: 40 to 55 cm. long, light green with inconspicuous, light greenish edge, a white area for 3 to 5 cm. above base. Leaf blade: 35 to 50 cm. long, 30 to 40 cm. wide, 30 to 40 cm. from tip to base of sinus, broadly ovate, almost horizontal, somewhat crinkled but not cupped, dark green; piko yellowish; lobes acute and usually overlapping, with medium-cut sinus. Inflorescence: Peduncle light green; spathe 22 to 25 cm. long, the lower tubular portion 4 to 5 cm. long, light green, the upper portion light yellow, rather tightly rolled. Origin, and derivation of name: Native variety; Moana meaning "broad" in Hawaiian, probably refers to the broad, ovate leaf blades. 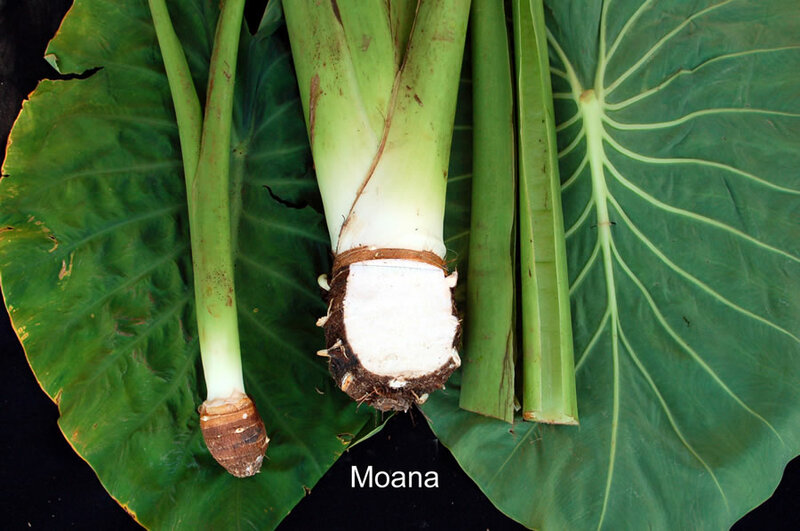 Distribution: A little-known variety, found in home plots on Maui. Use: Table taro of excellent quality.